Laquan McDonald’s murder might bring down one of the most powerful corporate-backed politicians in the country, Rahm Emanuel. Even mainstream corporate newspapers like the New York Times are openly speculating that Rahm covered up Laquan’s brutal murder for 400 days, to ensure he won re-election earlier this year. This follows last year’s uncovering of a secretly-operated Chicago Police detention center at Homan Square, where over 7,000 mostly young, black, low-level drug suspects were coerced into confessions without legal representation. As the scandal deepens and reaches further and further into City Hall, a USA Today Poll found 51% of Chicagoans think Rahm should resign immediately. Under intense political pressure, Rahm has fired his superintendent of police, his top detective and the head of the police review board. He has also accepted calls for a federal investigation into the Chicago Police Department, after previously refusing to do so. He has also attempted a public apology. But this is widely regarded as just a different kind of cover-up, and the record of cover-ups in Chicago is absolutely horrifying. Infamously, Area 2 Police Commander Jon Burge, who oversaw systematic torture to extract confessions from over 200 Black suspects from 1972-1991, was not convicted until 2009, long after the statute of limitations on the torture charges had run out. He was ultimately convicted of perjury but served only two and a half years of a four and a half year sentence and continues to collect his City-paid pension. The cost of his prosecution, defense and the many overturned convictions and damage suits filed by his victims exceeded $100 million and to this day, many of his torture victims remain incarcerated. Yet not one of his associates, including former Mayor Richard M Daley, then a zealous young prosecutor, have seen a day in jail. The only positive outcome of this sordid and brutal story was that former Governor George Ryan, who later was to go to jail himself for bribe-taking, was forced to first suspend, and then end the use of capital punishment in Illinois – because so many of the men on Death Row were shown to be innocent. CBS’s 60 Minutes has called Chicago the “false confession capital” of the USA. The cover-ups go back decades but little has changed. Judicial killings are no longer sanctioned by the courts, but extrajudicial killings by the police continue to go unpunished. Recently Lorenzo Davis, a Black supervising investigator with the so-called Independent Police Review Authority, which is appointed by the Mayor, was fired for refusing orders to cover up six cases of unjustified shootings by police. Of the 400 cases the Authority has reviewed since its inception in 2007, only one shooting has been found to be unjustified. Yet a study by the Better Government Association has established that the City of Chicago spent over half a billion dollars – $521.3 million – to settle police misconduct lawsuits from 2004 to September 2015. Only one of the officers who caused these lawsuits has been prosecuted; this was Officer Dante Servin, who shot a totally innocent young Black woman, Rekia Boyd, in the head because he was angry at someone she was with. His prosecution was sabotaged by State’s Attorney Anita Alvarez who filed the wrong charges so that the case had to be thrown out. That half-billion dollar bill does not include the cost of incarcerating innocent victims of police frame-ups. It would have made an enormous difference to the quality of life of Chicago residents if the money had been spent on public schools or libraries instead of covering up for brutal cops. In the wake of the Laquan McDonald case, Mayor Rahm fired the head of the IPRA who had dismissed Lorenzo Davis, but at a stormy hearing of the Authority on a recent weekday evening, speaker after speaker in public testimony expressed no faith whatsoever that the Authority will change. As for Federal investigations, these have a history of being so ineffective as to be virtually meaningless: for example, the Cleveland Police Department had already been under federal investigation for 20 months prior to Tamir Rice being murdered. Across the country, failure to root out racist police and end the entrenched racial bias in law enforcement shows the urgent need for a fully independent, elected community control board with full powers over the Chicago Police Department, including hiring, firing, and setting budget priorities. This needs to be linked to a wider program to address the vast inequality in dozens of US cities like Chicago. We need an immediate end to the racist War on Drugs, starting with ending “Broken Windows” policing which amounts to the mass criminalization of working class people of color and the immediate decriminalization and legalization of marijuana use, with full funding for drug addiction programs. In addition, non-violent drug offenders should immediately be released, with clean records, and with a fully funded jobs and housing program to assist reintegration into the community. We also need to recall all military-grade weapons from police departments. Laquan’s murder, and the yearlong cover-up, merely confirms what Chicagoans already knew: our city’s political establishment is rotten and corrupt to the core. As long as power in our city remains in the hands of the business-backed Democratic Party establishment, there will be no meaningful change. Rahm and Chicago’s elites promise only more of the status quo: more racist police harassment, brutality, and killings, more lives destroyed by mass incarceration, poverty, unemployment, housing insecurity, and cuts to education and social services. While Chicago might be an extreme example, dozens of cities across the country that are dominated by the Democratic Party are similarly suffering. Simply exposing Rahm will not be enough. We are urging all progressive forces, all labor leaders, all who want justice for Laquan McDonald, to mobilize their members for the demonstrations that are already occurring daily against Rahm’s deeply corrupt regime. If these forces throw in their full weight, tens of thousands of people could be mobilized to demand Rahm’s resignation. The Chicago Teachers Union which has fought Rahm’s corporate education agenda for years, along with other public sector unions who are facing the threat of serious attacks on their pension plans, could unite workers with Black Lives Matter to build a movement that confront the very foundations of Chicago’s rotten political machine. We can build a political alternative. Socialist Alternative’s Kshama Sawant was recently re-elected to Seattle’s City Council despite the all-out efforts by big business to defeat us. Sawant and SA built an energized mass base of support by taking an uncompromising approach to workers’ rights and racial equity. The political momentum created around Sawant’s election led to a victorious fight for a $15/hour minimum wage among other victories. With only one working class fighter in office, the landscape of Seattle politics has been transformed. Our movement can win victories like this in Chicago too but this will require a level of coordination and political clarity that we have not yet seen, despite the daily demonstrations calling on Rahm and State’s Attorney Alvarez to resign. Many of the most effective demonstrations so far, such as the closure of prime national chain stores on Black Friday or the march of two thousand through the downtown area at midday on Wednesday, December 9th, blocking traffic on the Interstate and at different intersections for almost four hours, have been semi-spontaneous with no clearly identifiable leadership in charge. But for these direct actions to maximize their effectiveness they need to put forward more detailed demands. For example, if Rahm resigns, who will take his place? The movement must build structures that allow activists to democratically discuss and determine its demands, tactics and strategy. This should include electing an accountable leadership which will fight for the needs of working people and oppressed groups in Chicago, with no links to corporate politics. 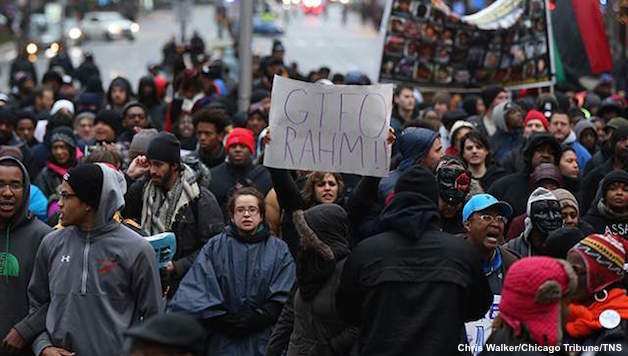 The key issue right now clearly is to build the type of mass mobilizations that can force Rahm out. This fight is not just about Chicago as it exposes the ugly reality behind the corporate Democrats’ claims to represent the interests of working people, black people and the poor. We need to turn the crisis in Chicago into a decisive challenge to the corporate Democrats as a whole. Hillary Clinton has already shamelessly attempted to coopt the Black Lives Matter movement by claiming to support it, despite her record of touting mass incarceration and welfare cuts. Rahm is a super-delegate for Hillary’s campaign and she has assured her continuing support for him. We say that Bernie Sanders, who has put forward a solid program for racial justice and whose campaign directly challenges these forces and speaks to the interests of working people, should come to Chicago and join the demonstrators in the streets. We need to force out Rahm. But let’s not stop there. Almost anyone would be better than Rahm, but we don’t need another Democratic Party alternative promising us 1,000 new cops. Let’s make this powerful movement against police racism a line in the sand in Chicago and build a new, fully independent political force in this city to remove the corrupt, corporate-backed Democratic Party establishment from power. Previous articleWhy Can’t Capitalism Go Green?